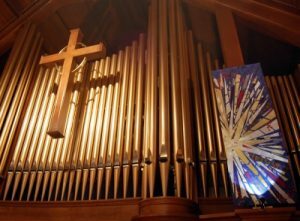 At Towson Presbyterian Church, corporate worship is the central act of our faith community. Music is one of the prominent ways that faith has been expressed and shared across the centuries. From the singing of a hymn, to choirs accompanied by a pipe organ, to instrumentalists of all types, tunes and melodies lift the spirit and give expression when words often fall short. Towson’s dynamic Music Ministry seeks to support the proclamation of the Word from week to week. Please consider joining one or more of our singing or ringing groups. There is a place for you. The Chancel Choir is the prominent leading body of congregational song in our church. We rehearse weekly on Thursday evenings from 7:30 – 9 p.m. and sing each Sunday morning for worship, except for when we break for approximately 12 weeks during the summer months. In addition to the literature sung on Sunday mornings, the Chancel Choir prepares major choral works and other programs that are sung either in worship or at other times in the life of the church. Music for worship is intentionally diverse, offering the widest inclusivity of western classical traditions as well as a healthy representation of cross-cultural practices, gospel, and spirituals. The Third Thursday Choir is a choral experience for anyone and everyone. Those who would like to participate may join the Chancel Choir to prepare an easy anthem to sing for worship the following Sunday. Rehearsals are on the Third Thursday of each month, and we begin with fellowship at 7 o’clock followed by a brief rehearsal from 7:30 – 8. No experience is necessary, and it is open to all ages. Similar in make-up to Third Thursday Choir, the Summer Choir meets on select Sundays through the summer months to prepare an easy anthem for worship. We gather at 8:45 in the choir room to prepare for worship at 9:30. The Chancel Handbells meet weekly on Tuesday evenings from 7:30 – 8:30. Dedicated ringers of all ages make up this ensemble. They support our Music Ministry in worship throughout the year playing voluntaries and hymn arrangements. They ring five octaves of handbells and three octaves of choirchimes. The Cherub Choir is for children pre-K through 1st grade who love to sing and make music. Both children and their parents are welcome to join in for a 30-minute class each week after worship. They sing songs, play games, and have fun. They sing periodically during worship and at other church functions. Lorene LaBerge is the teacher and Nick Salemi is the guitar accompanist. Contact Lorene at sing2melor@gmail.com. 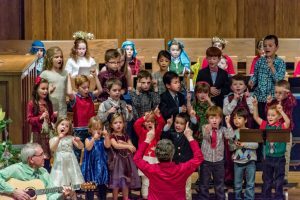 The Children’s Choir is for 2nd-5th graders who want to explore musical expression and prepare to lead worship. They sing as well as play handchimes and drums. Parents are encouraged to join in the fun. They meet for 30 minutes after worship each week. Stephen Harouff, TPC Director of Music, is the teacher. Contact Stephen at sharouff@towsonpres.org. Music is part of the curriculum at Sunday evening Youth Group for 6th-12th graders. With Glory to God: The Presbyterian Hymnal as our primary resource, we exercise our voices and opinions, and explore ways in which corporate song can influence our faith formation. Please click here to view the stoplist.